Due to the rain forecast for this Saturday, Decmeber 12th I will be selling my jams at Louden Nelson Center's Holiday Craft Fair from 10-4pm. Louden Nelson is located at 301 Center Street in downtown Santa Cruz. There will be over 30 local artisan vendors, live music, and homemade baked goods for sale. Their will also be arts and crafts for the kids to enjoy including gift making, and decorating ginderbread houses. So come one, come all and support your local artists by buying handmade gifts and ofcourse some of my yummy jams and gift baskets. Click here For more info. Sunday I will have my last jam stand of 2009, rain or shine. Since there's a 60% chance of showers expect a more scaled done model of my stand than usual or contact me at JeanniesJams@gmail.com for pick up later in the week. Happy Holidays! Come visit me this Saturday and Sunday from 10-3 for my end of the season jam sales at LoveApple Farm. I will have new flavors to share with you all- Curried Apple Chutney, Triple Ginger Jam, Lime Marmalade, Sugar Pie Pumpkin Butter, Cranberry Apple Butter and Strawberry-Balsamic Fig Jam. There will also be a small supply of precious offerings from the farm including amazing fresh picked dahlias, peppers, eggplants, squashes and tomatoes. It's a great place to visit and be inspired so bring the kids and pick up some of my tasty creations. Love Apple farm is the exclusive kitchen garden for Manresa restaurant. To learn more about the farm and to get directions visit farmer Cynthia Sandberg's blog GrowBetterVeggies.com. You can expect more posts about the farm in the future as it's one of my favorite places! 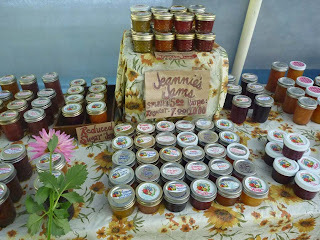 You can visit to check on my jams in stock, new flavors, recipes, sales events, 2010 classes and to see what I'm up to!